You might be wondering… why in the world host a professional chess tournament in Curaçao? Our chess community was small — around 150 active club chess players in 1962. Granted this small group of mostly men really, really wanted to organize a major tournament. They got to work to haul the 1959 Candidates Tournament, but they were unsuccessful due to timing/financial issues. In February 1959, the Netherlands Antilles Chess Federation, part of the Royal Netherlands Chess Federation, wrote a letter to their Dutch colleagues requesting that they inform the World Chess Federation (FIDE) that the Netherlands Antilles Chess Federation wanted to host the 1962 Candidates’ Tournament. That bid was accepted, and so the first Candidates’ Tournament outside of Europe was held in Curaçao! Awesome or what?! At the height of the Cold War, American Bobby Fischer, possibly the greatest chess player of all time, came in a disappointing 4th at the 1962 Curaçao Candidates tournament. 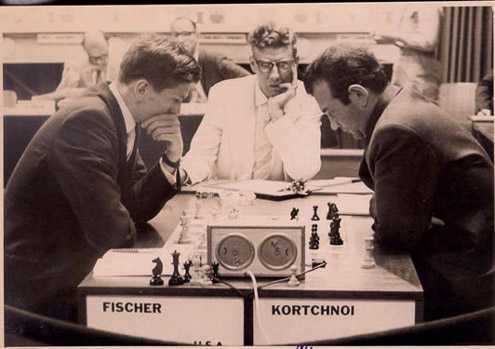 After Sports Illustrated published an article written by Fischer, headlined “How the Russians Fixed World Chess”, “the four Russians (Keres, Geller, Petrosian, Kortchnoi) had agreed on some draws in Curaçao, making them impossible to beat. They went swimming in the afternoon, got dressed, appeared at the start in the playing hall in the InterContinental Hotel, sat at their boards for half an hour, made a few quick moves, swapped as many pieces as possible and then offered a draw. “Nicha?” one asked. “Nicha” his opponent replied.